This topic of episode #1 – What Do I Need To Play Better Golf can be a bit subjective as are most of the subjects we discuss here at Golf More Swing Less. There is however, one thing I need to preface first. The word SUCCESS in and of itself is subjective and means something vastly different from one golfer to the next. For example, those who are new to the game or play infrequently may see success on the course and curing a slice or breaking 100. Others may see it as breaking 80 or shooting 1-under par. First, we are going to talk about what you DON’T need to be successful on the golf course. Iron fitting – What is the longest iron you should be carrying? Again, this is just the beginning of the conversation. Sure, there may be a handful of bullet points we could add to the list. In fact, if you have one, leave a comment below or tweet me at @golfmoreblog and let me know your thoughts. I can’t wait to hear from you. That wraps up today’s episode. THANK YOU THANK YOU THANK YOU for listening and or reading. I’m so excited to see and hear this show grow. 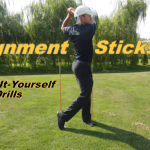 Golf More Swing Less cant be successful without you so please interact with the show and the site. I want to hear from you. If you have a show topic you’d like me to cover, just shoot me an email, tweet me or Facebook me. I’d be so appreciative if you could do me a favor and share this post and or podcast with your friends. Spread the word my friends and please come back.